The month got off to a very exciting start as I went on a ghost story writing workshop at The Regency Townhouse. Creative writing is something that I loved at school but have not tried since. I love using narrative and stories in my stitched work, whether from literature or history, so it was really exciting to have a go at writing my own. I was a little bit intimidated as others seemed to be experienced writers (although I did try to sit up straight and remind myself I am a non-fiction writer) but it was a friendly group and a lovely afternoon. There were two tutors, Bridget who led the creative writing and printmaker Jill Vegas who taught us how to make an instant book with imagery. The weather was terrible, which added to the atmosphere, and the walk around the house helped pep up the senses for sights, sounds and taste (being the Townhouse delicious regency cake was of course involved). It felt freeing to write, especially as all my writing is now done on the computer. There is definately a connection between imagination and handwriting, and what is wonderful is my writing is so scruffy (when I was 17 my boss at a part-time job actually told me off about my bad handwriting) no one else can read it so I don’t have to worry about criticism. I do intend to jot down more stories and will eagerly look out for any more creative writing courses. I didn’t get much time this month to carry on with what I started as I had my head down working on some editing jobs. 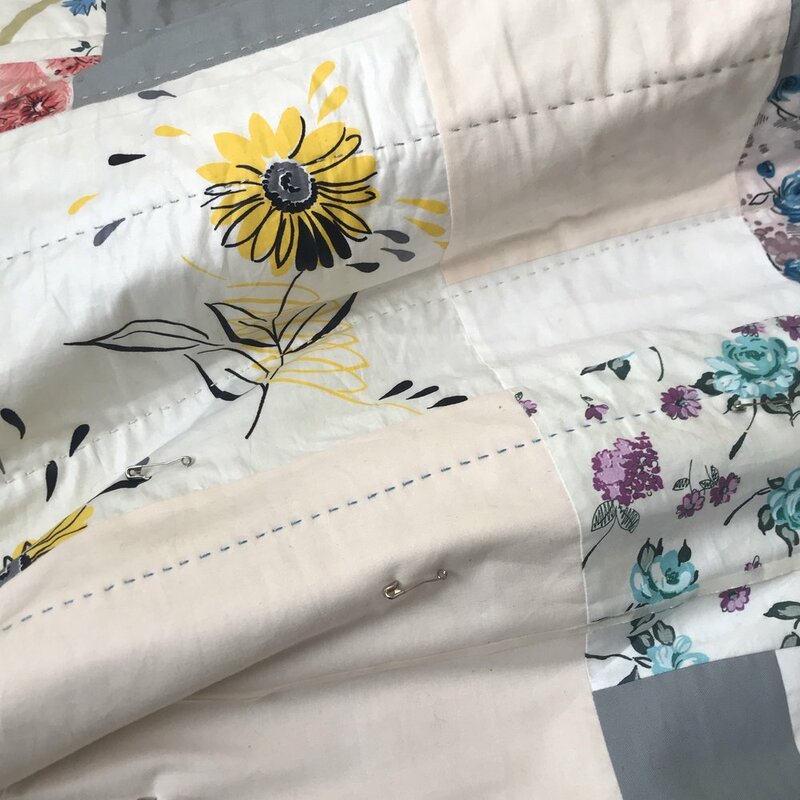 I am now focussing on some quilt writing and designing, more of which I can talk about another time, so that is really exciting and has put a spring in my step. A piece of my Brighton printed fabric got an outing as a sample for a beginners class that starts next week. I finished the cushion on a Saturday afternoon then hot-footed it down the seafront to get it photographed before it got dark. I adore this time of year, but it isn’t good for photography. I love the ticket this fabric is based on, makes me think of a couple being hand in hand on the seafront and a photographer stopping to take a snap. They cannot of collected the photo though so maybe they had a row, or less dramatically couldn’t afford it. I finally layered and started quilting my vintage fabrics grid quilt. You cannot quite see from the photo below but it is made of squares cut from a mixture of vintage and plain fabrics that were put on a design wall to figure out the placement then sewn in sections. I have decided to hand quilt straightish lines in perle thread in a random grid to echo the piecing. Amusingly I saw it being quilted with big stitches but the traditional hand quilting I have been doing means my stitches are small. I see it like handwriting though, I could force it to how I want it to look, but it is more relaxing to do what stitches come naturally. I’ve been trying to get out and about before winter is truly here and we went on a fun day trip to Hastings which I will share in future post, and a rather good walk at Hollinbury Hillfort. The views are stunning and the route we took meant we had amazing views across the city and beyond. Finishing up at the clubhouse for a cuppa I would go as far as saying it’s probably the best walk in Brighton.